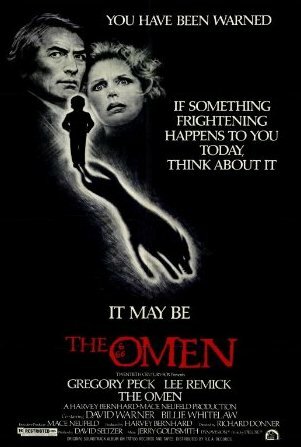 The Omen – Did You See That One? Ambassador Robert Thorn (Peck) and his wife Katherine (Remick) are the protective parents of their only child, Damien (Stephens). When mysterious deaths begin to surround them, Robert is faced with the possibility that his son might be the anti-Christ. The American Film Institute placed this film at number 81 on their “100 Years… 100 Thrills” list in 2001. This was directed by Richard Donner (Scrooged), with a screenplay written by David Seltzer (The Other Side of the Mountain). The movie stars Gregory Peck (To Kill a Mockingbird), Lee Remick (Anatomy of a Murder), and Harvey Stephens. The cast also includes Billie Whitelaw (Quills) and David Warner (Titanic). This story takes a fairly simple premise and turns it into a great movie experience. The idea of the child of Satan being born to unsuspecting people has been done a number of times, but this is one of the more successful efforts. The characters of Robert and Katherine Thorn are written with deep desires that create great conflict throughout the movie. Every step of the way the two are beset by characters that increase the tension and confusion. These many supporting characters are all very complex and interesting. Like most really good movies, nothing feels excessive or unnecessary. The story also pays off on every setup throughout the film. Thanks to the writing, this is a great psychological thriller. Gregory Peck isn’t someone I automatically associate with horror films. I think this goes to show just how good he was at adapting for a role. He leads the way in this movie with a performance that embodies the confusion, inner-turmoil, and fear that the story creates. He’s joined by Lee Remick, who does a great job with her part in this one. She’s able to handle the emotional requirements of her character with great skill. Billie Whitelaw and David Warner both add nice work to the film. Their roles are essential in keeping the tone of the story intact. Finally, Harvey Stephens was a great choice for the young Damien. This would be his only work in Hollywood, but he created one of the best and most memorable demon children of all-time. As a whole, the acting does all the right things to make this more than a typical horror film. This movie features one of the great scores in the history of horror and thrillers. Jerry Goldsmith (Rudy) won the Oscar for Best Original Score, and was also nominated for Best Original Song. The music features a strong choral Latin chant that sets just the right tone early in the film. The music seems to creep in and out throughout the movie, just like the darkness of the demonic presence within the film. The visuals in the film seem to mirror the tone set by the score. The use of light and shadow play nicely with the intensity and uncertainty of the story. The camera work also seems to find the right angles to keep the audience from getting comfortable. The visuals accurately capture the many questions that linger throughout the movie, and make this a really great watch. This is one of the better horror films ever made. The story is simple, yet seems to attack from all sides. The acting does great work with the story, and the film features some big names. The score ties all of the aspects of the movie together perfectly. If you’re a horror fan, I hope you’ve already seen this one. I would also suggest this to fans of Peck or anyone else in the cast. This is intense and very dark, but it doesn’t succeed through gratuitous violence. I give this one 4.5 out of 5 stars. Pingback: The Exorcist | Did You See That One?